This is a question I hear often, so today I thought I would share my own experience with vitamin D and provide a reminder of how important this vitamin is to health, especially in the winter! You can read more detail about Vitamin D’s Role in Health Support at the World’s Healthiest Foods page on vitamin D.
Beyond these major areas, there are many therapeutic uses of vitamin D supplementation and more emerging every day as research on vitamin D evolves. In my practice, I consider vitamin D for many types of female hormone imbalance, elevated cholesterol, and long-term health promotion. 1. We don’t get naked enough! Imagine how early humans lived… They wore little clothing and spent most of their time outdoors in warm weather, so they made lots of vitamin D in the summer, which was stored in their bodies and used during the darker winter months. Is this how you live today? I doubt it! Most of us spend most if not all our time indoors and when we are outdoors we cover up with clothing, hats, and sunscreen. All of this means we make little to no vitamin D at all from the sun. 2. We can’t eat enough vitamin D! Unlike most other nutrients, there are few foods that provide vitamin D. Because we mostly get vitamin D via the sun, food is really just a back-up support system in this case. As you can see, my vitamin D level increased in that 5 months to 87 from the increased supplementation. Yay! So, once again I’m going to increase my supplementation to 4000IU vitamin D3 daily and I should probably continue this dose or slightly lower to keep my levels in the optimal range. 4 Responses to How much vitamin D is best? Ok I am only taking 2000 units per day so I probably need to be retested. Definitely a good idea to test your levels to determine the right supplementation for you! Did you feel any different or notice any differences with the “low” level and the “normal” level? 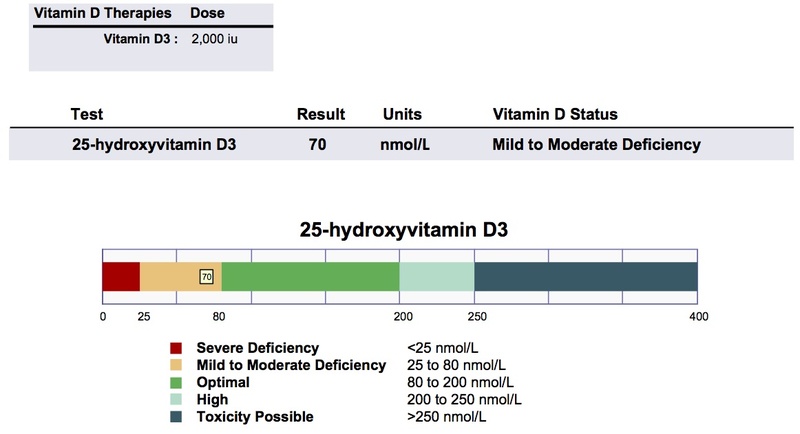 No, I did not feel different at different levels, and that is the problem with vitamin D – you need to test to understand where you are at and how to supplement appropriately! The “symptoms” of vitamin D deficiency are really related to outcomes of chronic deficiency, such as osteopenia/osteoporosis, etc.